Kiki Kapany combines a background in media and law (J.D. ’86). Her experienced legal sense, paired with a sound creative approach to production on a worldwide scale, adds a key dimension to Kikim’s resources. She manages all of the entertainment law and day-to-day business required in Kikim’s operations, including overseeing business development, strategic planning, finance and administration. Her expertise extends to the creation and management of major production budgets, extensive image research, grant reporting, organizing project deliverables and managing all production and post-production logistics for a wide variety of projects. Kapany was executive producer on all Kikim Media productions for public television including the Emmy-nominated program In Defense of Food (2015), critically acclaimed at over 20 film festivals all over the world, and The Botany of Desire (2009) based on Michael Pollan’s best-selling books; Capturing Grace (2014), a one-hour observational film that documents the intersection between those who live with a movement disorder (Parkinson’s Disease) and those who move for a living; My Father, My Brother and Me, a chronicle of Parkinson’s disease, for FRONTLINE (2009), and Hunting the Hidden Dimension, the story of fractal geometry, for NOVA (2008). She also executive produced Ending AIDS: The Search for a Vaccine (2005), widely praised as a compelling chronicle of one of the world’s greatest biomedical research challenges, as well as the groundbreaking Muhammad: Legacy of a Prophet (2002), honored with a Special Jury Award from Ciné Golden Eagle and a Bronze World Medal from the International Film and Video Festival of New York. Kapany’s other programs for public television include The Next Big Thing? ; Stopwatch; Naked to the Bone; and In Search of Law and Order (three hour production on alternatives to the juvenile justice system). Kikim Media also produced and directed three short videos for the Gordon and Betty Moore Foundation, a series of 27 short videos about fascinating social entrepreneurs for the Skoll Foundation, a series about diabetes for the University of California, San Francisco Diabetes Center and the Diabetic Youth Foundation, and the special features for HBO’s DVD release of Deadwood. 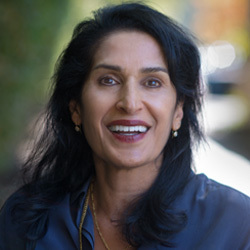 She is currently executive producing Silicon Valley: The Untold Story (forthcoming 2018), a three-hour series about the cultural, technological and intellectual history of Silicon Valley and The Ornament of the World (forthcoming 2018), a two-hour animated and live action documentary for PBS about relationships among Muslims, Jews and Christians in medieval Spain.